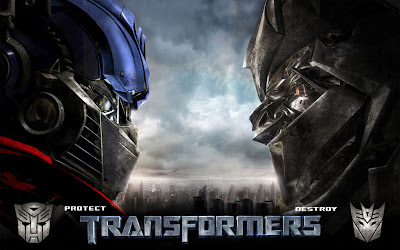 A new theatrical trailer for the Transformers movie has been released and I must say it looks pretty darn good. I honestly can't wait to see this thing. So far it looks like it'll live up to everyone's expectations, so let's keep our fingers crossed. I just hope they don't implant too much of a love story into it as Hollywood so often does these days. For example, in the part where Bumblebee comes to life, look closely at the radio. The new password to the SectorSeven site is revealed there. You need to watch it in high definition to see it. So in case you can't see it clearly enough, the current password is: CODEBLACK. The SectorSeven site is a little odd and takes some getting used to, but once you figure things out you might just find some exclusive video, including that of Generation One Bumblebee. You can also see some exclusive Dinobot and Insecticon action as well. I can't wait for this to come out! I've been following the different movie forums and everyone seems to be dying with anticipation. I know, it looks really damn good. And the transformations in the latest trailer look phenomenal. I'm on the edge of my seat already! The trailers keep getting better and better for this. I can't wait! Being the geek I am, I went to see Transformers on opening weekend. It was awesome!! I was especially surprised at how quickly the action started!